Argyll and Bute Council planners gave the thumbs-up to the design, but did not consider that location suitable. It was then suggested that it might be sited at the foot of Sinclair Street on a grassy area beside the entrance to the pier car park, but the council's Helensburgh Area Committee vetoed the idea. Babcocks at Faslane are standing by to have it made up in steel by their apprentices under training, at no charge, and the Royal Navy may be able to assist in transporting it to the chosen site. Structural engineer David Nicoll worked on the project, and the Helensburgh building firm of Stewart & Shields are standing by to lay the foundations once a permanent site can be agreed. 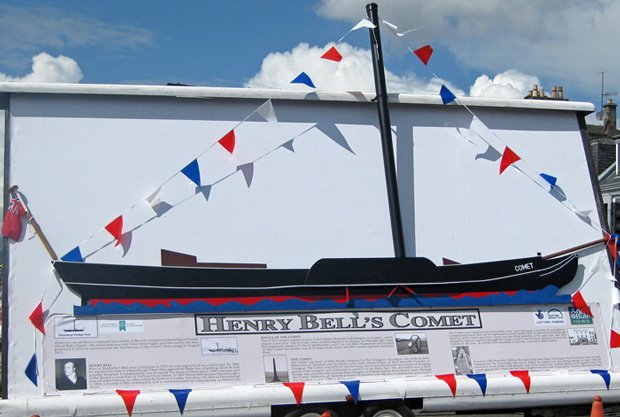 A wooden model of the Comet Gate prepared by the apprentices was on display at the Helensburgh bicentenary celebrations at the town pier on Saturday August 4.